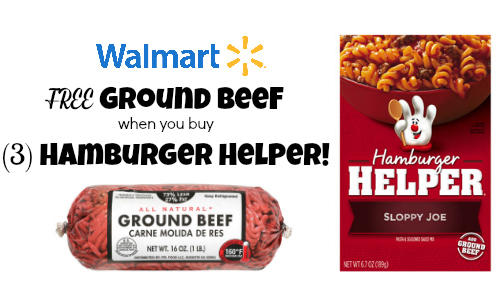 Don’t miss a rare rebate to get FREE Ground Beef when you buy (3) Boxes of Hamburger Helper! With beef prices going up, you don’t want to miss this. The rebate is valid for any size, any brand of ground beef, up to $6.44 and is only valid at Walmart. Hamburger Helper often goes on sale for $1, makes it 50¢ a box after the coupon with FREE beef! The rebate ends 5/19 and be postmarked by 6/19. There is a limit of 2 rebates per address or household. The rebate may not last long, so print it now.